I am please to announce the reposting of my thoughts on June Jordan on another website. 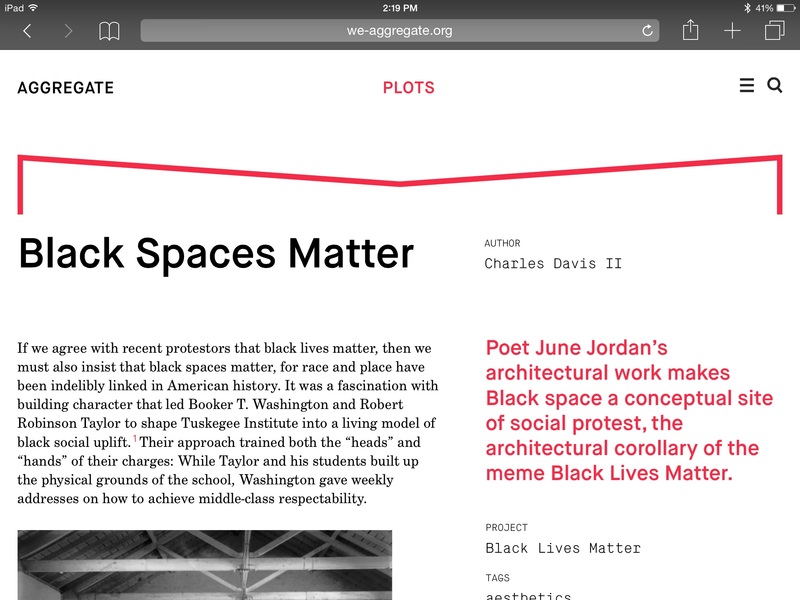 The Aggregate collective, an experimental forum for architectural historians had recently curated a call for papers on the recent Black Lives Matter protests. This effort was headed up by Professors Jonathan Massey (California College of the Arts) and Meredith TenHoor (Pratt Institute). My contribution can be found here. There are some wonderful pieces in this particular issue, including a striking analysis of the school-to-prison pipeline in many poor black neighborhoods, as well as some creative applications of Henri Lefebvre’s and Immanuel Kant’s philosophies to contemporary problems. This is a wonderful resource for college professors interested in teaching students about the spatial implications of contemporary events. I wanted to share a link of a teach-in at the California College of the Arts (CCA) that is related to the topic of this post. 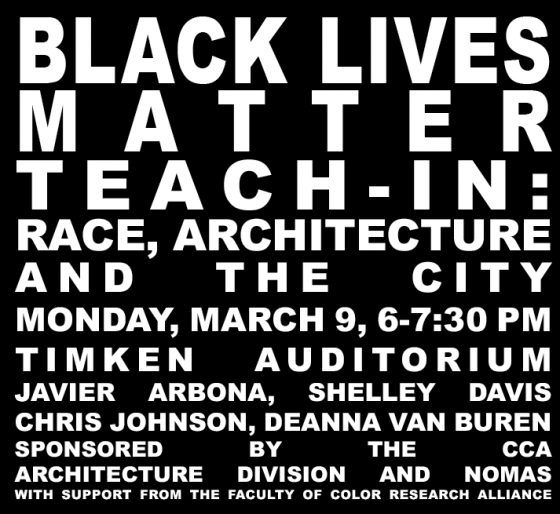 The event was entitled “Black Lives Matter Teach-In: On Race, Architecture and the City”. This event was organized by Jonathan Massey, Dean of the Architecture division at CCA and editor at Aggregate. It should prove to be a useful teaching tool for those enrolled in one of the design disciplines, especially those that engage with public space. It may also be of use to faculty in the humanities that teach on issues of the city, on the professionalization of minorities, and on race relations in all areas of society. Join us for a conversation about how the disciplines of architecture, interior design, and urbanism can respond to the issues of equity, race, and state violence raised by the Black Lives Matter movement. How does the design of the built environment contribute to inequalities of habitation, movement, access, and representation? How do these issues manifest themselves in our teaching and learning? How can designers help construct a more just and peaceful society in which all lives are cared for equally?